Australia Day occurred a few days ago. Besides thinking about how much I'd love to swap the battering winds for the sun and beach, it made me think about how many Australian wonders you can find in the UK. My first Australian find is a fit skin wonder that I discovered on Instagram a few months ago. It's one that I know you'll love as much as I do, especially as it's key ingredient is a favourite of mine: matcha. 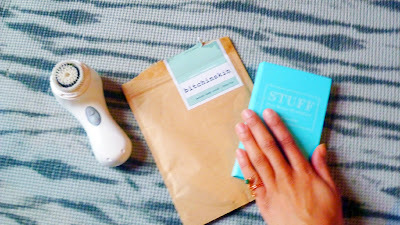 I love coffee scrubs, but it's definitely met it's matcha with this Bitchinskin scrub. On the evenings of a weekday rest day, I love nothing better than a bubble bath, hair up and getting dirty with Bitchinskin. The longer you leave Bitchinskin on your face, the longer it works its magic into your skin. Unlike coffee scrubs, where the coffee and sugar combined result in large granules that can be rough on sensitive skin, Bitchinskin is perfect for a lot skin types; matcha is a powder and the brown sugar used in the scrub is, as a result, not harsh. I've found that when you apply it on your face and/or body, it works really well if you softly apply it into your skin, in a circular motion. The coconut and peppermint gives it a further 'oomph' that is mightily addictive. 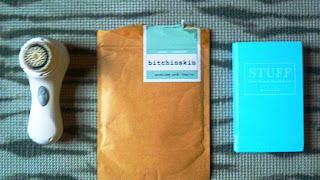 Whilst opening the packet of matcha scrub, the scent wafts through and sets the mood for what's to follow as you get personal with Bitchinskin. Part of me loves the cold weather and has been waiting for this hat-scarf-gloves weather to make an appearance for a long time. Last October, in mid-excitement, I bought a lot of winter running gear. As the weeks went on, I waited and waited for the weather to turn. It was bizarrely like the sort of feeling you get when you buy a dress for a special occasion and then count down the days until the event. The one thing that I find frustrating when running in cold weather is that it can leave my skin feeling quite dry, especially when there's a very cold wind. I discovered a balm that has solved this problem and leaves my skin feeling supple and hydrated; it's definitely What My Skin Needs. I use this on the days of my long runs as getting dry skin is something that only seems to affect me when it's a long run. I'm guessing it's because I'm out for a longer period of time, though I'm not fully certain. 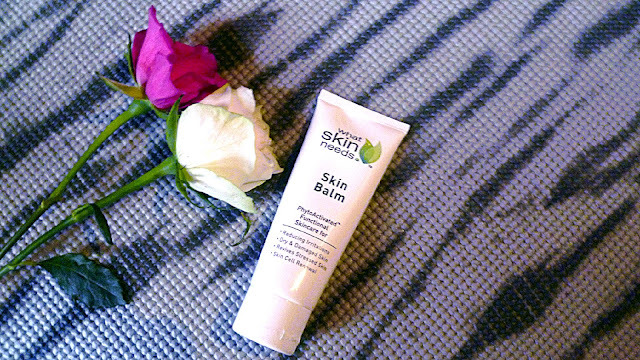 My Tuesday long runs are my work-to-home commute; I remove my make-up, apply toner and then What Skin Needs' balm. The evenings are much colder than during the day and I'm finding the balm helps in creating a barrier between the biting winds and my skin. This is down to the plantolin in the balm, which helps with rehydration and repairing dry skin. My Saturday long(er) runs are, in contrast, done in the morning, or rather, as early as I can wake up! A quick use of a facial wash and then application of the What Skin Needs' balm and I'm good to go. There is no doubt, that the Aussies rule the roost when it comes to fit fashion. I love my tights to be bold, have wild prints, or....well, when I think about it, I like something that is a statement and colourful. The Aussies know how to design unique pieces of activewear. There are too many to name, but Running Bare, Nimble and Lorna Jane for dressing head to toe whilst Dharma Bums for dressing bums are by far my favourite brands. I'm always on the lookout for different brands, wherever they're from, so I'd love to know your favourite activewear apparel brands. In the UK, Lorna Jane can be found at Active In Style and House of Fraser. If you've not come across Active In Style before, it is THE place to go to in London for women's activewear apparel from an array of different brands. They recently opened their store at the King's Road but if you're not based in London, or the UK, you can always pop over to their website. 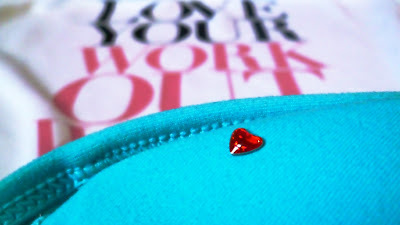 I just love the attention to detail on this Lorna Jane bra: The hidden gem is inside the bra. In case you're wondering, I wear these bras only during low-impact activities, like yoga, as the support isn't enough for me for running or HIIT. They've got you covered for activewear apparel, so naturellement, an Aussie fitness class is on the cards for you. The Americans gave us Barry's Bootcamp and indoor spin cycling. The Aussies have given us F45. It's functional-based training, using the prowler, weights and TRX to name a few. The studio opened its first London studio a few months ago. I haven't been yet, but my social media is going wild with everyone loving F45. It's a place that is firmly at the top of on my ever-growing fitness-classes-must-attend-list. Have you attended an F45 class yet? What did you think of it? London is it's first Europe studio but they do have studios across the world, including US, Canada and New Zealand. I can't wait to get sweaty at F45. And then there was food. The way to my heart. If you 're wondering what this strange concoction is, the pronut is healthy version of the doughnut. Unlike its cousin, the pronut is low carb, baked rather than fried and far, far less sugary. When I bake pronuts, I also add protein powder. They are easy to make, are soft and slightly sweet. Alone they can taste a little uninteresting, but using toppings or fillings can instantly transform the pronut. My ultimate pronut is one that is topped with prutella, chia seeds and a dash of sea salt. Utter heaven, especially after a sweaty workout. In London, you can also find pronuts, by the number, at Protein Haus , in Canary Wharf. No wonder they excel at all sports: The Aussies know what to do to look and feel fit! Now all I need is a plane ticket to the Land of the Oz. **I was gifted an item from this brand. However, all my opinions are honest and my own. The links included in this post are not affiliate links.